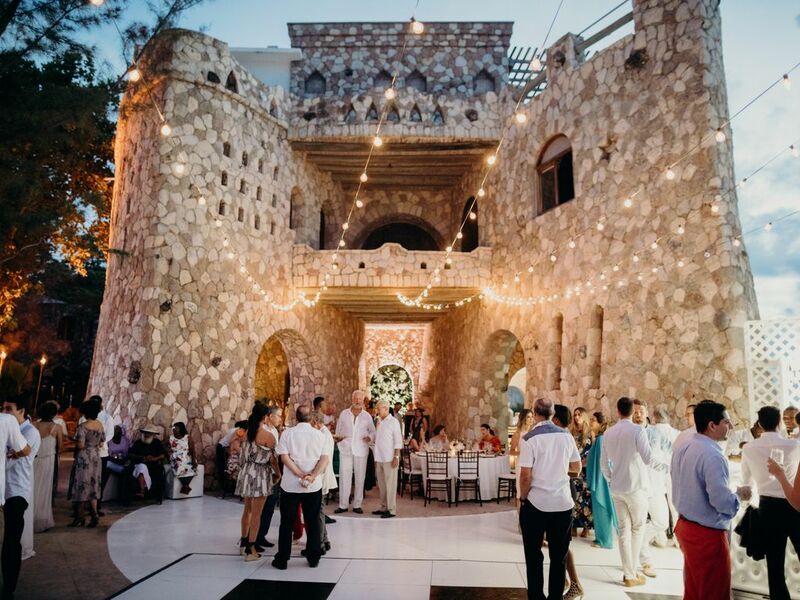 Pattoo Castle a Jamaican experience like no other. Pattoo Castle is a luxury villa rental property located in the laid back town of Negril on the West Coast of Jamaica. Situated on a cliff with magnificent, unobstructed views of the Caribbean Sea, offering privacy and seclusion in a quiet and unique setting. Pattoo Villa is the perfect setting for couples, families, extended families and small groups. The newly refurbished villa features eight bedrooms each with its own en-suite bathroom and controllable air-conditioning units (except bedroom 6). The villa also features two kitchens, your personal housekeeper can prepare light breakfast or a Chef can be hired for the full duration of your stay or for a special event. all showers are walk in. Bathroom 2 has two sinks. steps lead from the pool patio in to the sea. High Speed in public and Bedrooms. Ground floor, Microwave pot/pans/coffeemaker/juicer/blender/toaster. China/Glass/flatware. Bench and eating. One Table X 10 Extra tables can be added MAX 20 persons. We were fortunate to have our wedding at Pattoo and spend the weekend staying the castle with our families. We all really enjoyed our stay. The castle is beautifully kept and each and every room is nice. The staff is friendly and helpful. There’s a daily housekeeper as well as the security outside at night. Gary is a great host, very responsive and accommodating. Easy location in the West End road in Negril. There’s good local food and a convenience store across the street, otherwise there are taxis frequently driving by that can take you around the area. Thank you Pattoo Castle for the great memories. The house has its quirks but it is a beautiful place and we enjoyed every minute of our time there. We had a beautiful wedding and the space was perfect for our large group. The staff was great and Gary was extremely responsive and helpful. Definitely a bucket list check off. I spent my 50th Birthday at the Pattoo Castle with 9 of my closest friends and it was more that I dreamed. Gary and the staff were wonderful, I will definitely return. At the time that we made the reservation there were no reviews of the property and just a few photos. I was a bit worried that the place would not be large enough for our group of 5 families with a total of nine children and 11 adults. My concern was that we wouldn't have enough room to spread out and we would be on top each other for a week. When we arrived at the front gate and the wide stair case welcomed us, I knew we were about to be surprised. Once in the door we were blown away by the scale, the space and the design. We loved the contrast of the white, the wood and the stone with modern finishes. Everything was very minimal and tasteful, letting the architecture and the landscape shine through. 3 complete floors of total wow factor! We spent our sunsets on the roof top with rum and Tings. During the day we spread out on the balconies of the castle, the verandah by the pool and the perches on the cliffs over looking the blues of the sea. We jumped off the cliffs and snorkeled directly from the house. The Staff was wonderful and welcoming and took care of us as if we were family. Janice and Coral cooked and shopped for us. Janice's jerk chicken was some of the best ever! Patrick was a savior cleaning the kitchen for us and set our girls up with an in house hair braiding session. I just can't express how much we appreciated them and how fully taken care of we felt. The location of the house was perfect for venturing out. We walked to Rock House a couple times and the guys took taxi's all over. Gary was a great communicator and took care of setting everything up including transport to and from the airport. He has curated a wonderful experience for his guests. It was one of the best vacations ever! We all want to go back--pronto! Thank you! Much love and respect to our friends at Pattoo Castle. Castle located on cliff next to sea with many restaurants and bars within walking distance. 3 miles from Negril center and 7 mile beach.